By now, we’ve learned to accept that fact a good proportion of the ports on Nintendo Switch are games that released elsewhere years ago. Sure, it often feels like a late-to-the-party cash-in at times, but there are plenty of Switch owners who have likely never played these games previously, having only owned Nintendo-made hardware. And, of course, it always helps if said older title has something about it to help it stand out along its fellow ports. Enter Astebreed, a 2014 shoot-’em-up that mixes break-neck speed, bullet hell mechanics and a 2.5D plane that’s constantly shifting the goalposts. Its dynamic camera starts off innocently enough, with your otherworldly mech thundering through an alien stronghold in a side-scrolling affair. 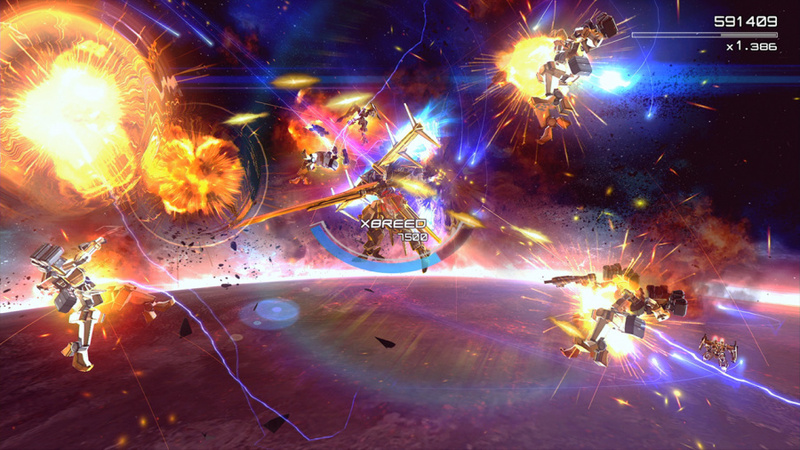 Enemies fly towards you in synchronised swarms, swirling in the foreground and background before returning to your plane so you fire your blasters or swing your giant sword at them (because who pilots a Gundam-esque suit without an equally gigantic blade?). 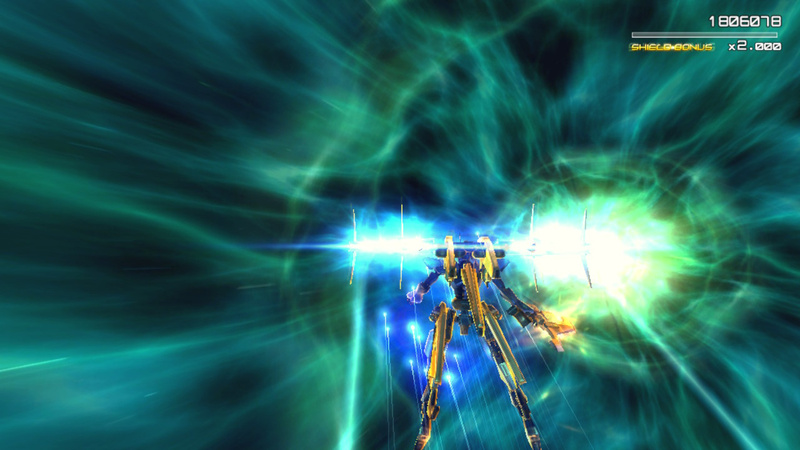 Suddenly, the camera shifts and now you’re fighting upwards, Ikaruga-style. Then the camera shifts over your shoulder, turning Astebreed into an on-rails third-person shooter. Mixed with the sheer speed of each level and the impressive amount of action that’s thrown at you from the moment you boot up the game, this constantly shifting perspective gives Edelweiss’ hit shmup a real sense of personality and distinction - which really helps considering just how many other shooters of this ilk are available on the eShop right now. And when we say sheer speed, we’re not kidding. Astebreed moves at a blistering pace, hurtling you through vortexes and cityscapes as you unleash all manner of weaponry on all manner of alien beasts. There’s a story about a pilot called Roy and humanity’s attempt to hold back the constant threat of an extraterrestrial horde, but it’s pretty rote by Japanese sci-fi standards and the lack of an English dub means the tiny dialogue boxes that pop on-screen during battle are almost impossible to follow since your attention is entirely focused on total chaos unfolding before you. Thankfully, the gameplay itself mostly manages to make up for the narrative tropes going on in the background. Your powerful flying mech - the X-Breed - comes outfitted with some laser cannons you fire with ‘ZR’, as well as the aforementioned mega blade that can block incoming enemy fire and be used to dash in and slash foes for some up-close-and-personal negotiation. Of course, this being a shooter, you’d be tempted to hang back and let your guns do the talking, but the developer is wise to your ranged ideas and weaves in enemies that can only be dealt with via a swing of your trusty sword. It’s a neat way of urging you to dash in and away at opportune moments, using gaps in enemy fire to level the playing field. You can unleash a powerful slashing attack that charges over time, launch a barrage of missiles by flicking the analog stick and lock onto any foes in your immediate vicinity by clicking and releasing the same stick. Thankfully, the Nintendo Switch port benefits from ‘Arrange mode’, which remaps the buttons to better suit a controller. Since there are just so many weapons to juggle, and so many foes to track on screen, we found playing in docked mode with a Pro Controller the best way to experience Astebreed. The Nintendo Switch port offers a decent iteration, but your enjoyment of its wares will depend entirely on whether you’ve played it before on another platform. 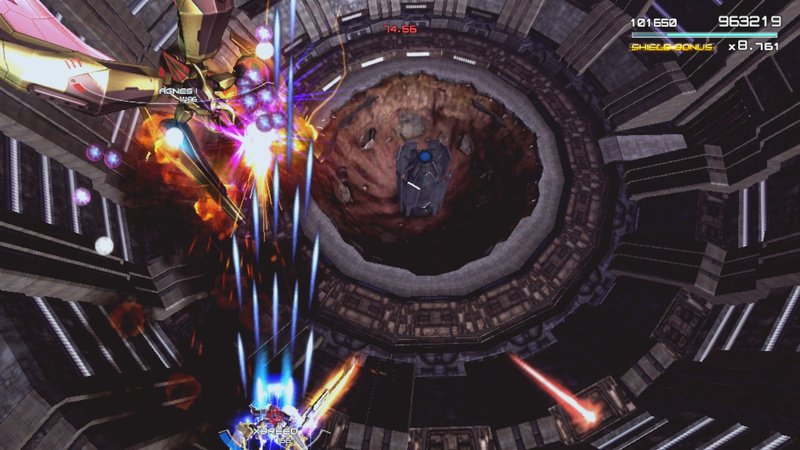 If you’re new to this over-the-top shoot-’em-up, you’ll likely appreciate its fast-paced action, over-the-top boss battles and bullet hell levels. Performance holds up for the most part, but when things get really busy, the frame rate does start to chug. 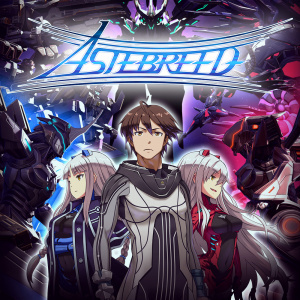 If you have played this before, be it on PC or PS4, you will notice that Astebreed has taken a noticeable graphical downgrade to get it up and running on Nintendo Switch. Assets aren’t quite as detailed and the lighting system isn’t quite as striking as it is on other platforms, but bar those aforementioned occasional performance issues, it’s a pleasantly robust port of a four-year-old game. If you haven’t played Astebreed yet, and you love your shmups, its debut on Switch offers a fine place to experience it. Nintendo Switch has plenty of shmups to its name, so Astebreed finds itself rubbing shoulders with some of the best retro and modern examples the genre has to offer. With its shifting planes and the constant switch between ranged and melee combat, it manages to offer just enough extra spice to help it stand out, although the lack of an English dub makes its story nigh-on impossible to follow unless you understand Japanese. Still, developer Edelweiss has made an effort to make its previously unwieldy controls fit the confines of the Switch's control interface - although you really should invest in a Pro Controller if you want to enjoy Astebreed at its best. It's not a masterpiece then, but remains worthy of investigation if you love the genre. Kind of what I expected from reading other reviews. I'll wait for a sale, but I was impressed by what I saw in the trailer. Bought it on release and loved it. Can understand the review though. The story was impossible to follow and the action can reach staggering levels. Also I’m one of those who never played the game before. Don’t own a PS4 and whilst bought it on sale on PC, had trouble getting the controller to work and frankly couldn’t be bothered. I like my games ready to go straight out of the box / installation process. Not having to then perform some troubleshooting to get a controller working as desired. I made a review on this just the other day, and its a shame that there was no focus on the fact that the game is only 6 levels long, and can be beaten in under an hour with almost no replayability at all. Due to this the story suffers severely since it flys on by with no real weight to it, and its hard to justify the asking price when you can get decent long lasting indie games for far less than the asking price. Its a stunning game, with visuals on par with some AAA games. But beyond the first like 30-minute playthrough, it has nothing else to offer. Astebreed instantly reminded me of Sin & Punishment. How good is it compared to the master in the genre? I get Sin & Punishment feels from this game. I usually don't like bullet hells, but damn if this game doesn't look fun while it lasts. I'll wait for sale and keep it in my backlog for now. I always like a good on-rail shooter! @Hikingguy it isn't a rail shooter at all. There are a couple of levels that shift perspective and that's it. it's played side on for 90% of the game. To hear that this isn't a flawless port is disappointing. There should be absolutely no reason why the switch cannot do this game. I can run it on a six year old low level PC with a basic graphics card flawlessly. You know something is wrong when a 4 year old game "start to chug" on Switch. You can run this on a POS RX460. @Agramonte We'd probably need someone with experience programming for the Switch to answer this, but it would be interesting to know why. Is it just a sloppy port? Or is it hardware related like the SNES where they system which is otherwise fine, just can't handle a large number of simultaneous objects on the screen? I ending up getting this a while on PC for my gaming laptop. I liked it. I still have yet to boot it up but will do so sometime in the future. @TheFox it absolutely must be. I can run this on my low end old pC without any problems. The switch could brezze thos. 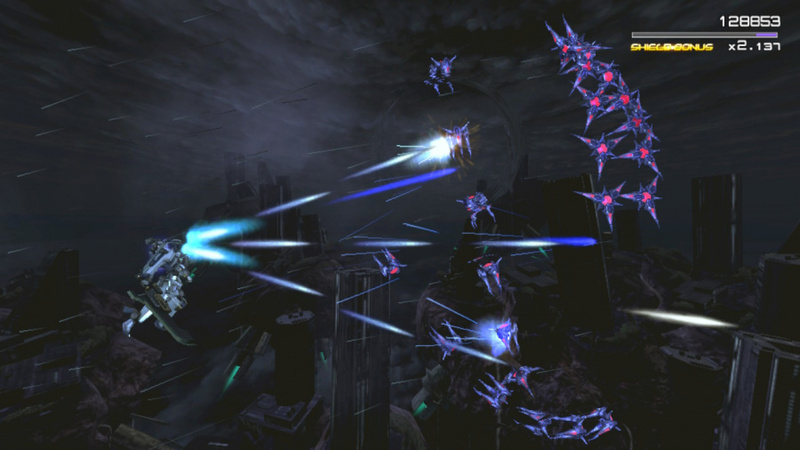 @Hikingguy Yes, its a sider scrolling shoot-em-up with altering aspect views that make it at times a 3d rail shooter. those bits control awkwardly and are really not very good. the game is good overall but i'd seek it out on another platform. I also picked it up on launch, especially since the UK price was much lower than the US one and I enjoyed it. It does get overwhelming at times, but I only died on the final boss. Problem is, I never felt like I was doing all I could - most of the time I was just surviving. And yes, the story is pretty incomprehensible and having the dialogue be displayed on screen during battle...it's kind of impossible to follow. But in spite of its shortcomings, I did enjoy myself. @TheFox It could just be they not sure how many they will sell and do not invest the time in optimizing it upfront.